What’s happening with Hap Collins and Leonard Pines? Has the Hap and Leonard TV show been cancelled or renewed for a fourth season on SundanceTV? The television vulture is watching all the latest cancellation and renewal news, so this page is the place to track the status of Hap and Leonard, season four. Bookmark it, or subscribe for the latest updates. Remember, the television vulture is watching your shows. Are you? 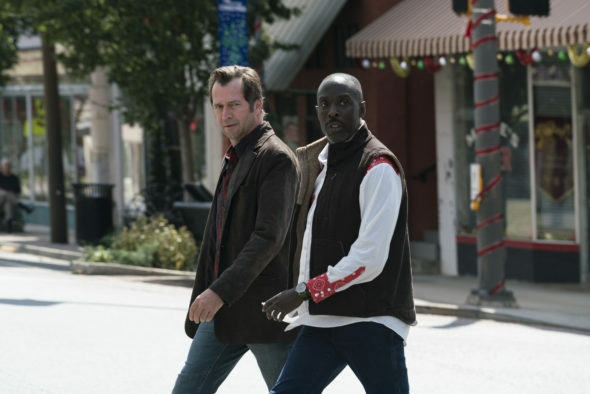 A SundanceTV anthology series based on the Jon R. Lansdale novels, Hap and Leonard stars James Purefoy as Hap Collins and Michael Kenneth Williams as Leonard Pines — lifelong best friends. Returning as season regulars are Tiffany Mack as Leonard’s lawyer, Floria Grange, along with Cranston Johnson as Detective Hanson. Season three, Hap and Leonard: The Two-Bear Mambo, also stars Louis Gossett Jr., Corbin Bernsen, Andrew Dice Clay, Laura Allen, and Curtis Harding. The darkly comedic, crime drama unfolds in 1989, in East Texas, just prior to Christmas. Hap and Leonard set off to find Florida, who has gone missing in the Klan-infested town of Grovetown. With an epic storm impending, Hap and Leonard are soon confronted by a cast of characters Sundance says is, “…so tough they could chew the bumper off a pickup truck.” This gang includes a questionable sheriff, as well as the leader of the Caucasian Knights. “The boys learn that the good guys don’t always win, and nobody beats Mother Nature,” according to the network. The third season of Hap and Leonard averaged a 0.04 rating in the 18-49 demographic and 200,000 viewers. Compared to season two, that’s down by 20% in the demo and up by 15% in viewers. Learn how Hap and Leonard stacks up against other SundanceTV TV shows. On May 15, 2018, Hap and Leonard was cancelled. Could it return for a fourth season one day? Stay tuned for further updates. Will SundanceTV cancel or renew Hap and Leonard for season four? It’s really hard to say. Viewership is up but the numbers are really small. I suspect this show’s survival prospects have a lot to do with other factors, including if the talent wants to continue making another season. I think it will be renewed but it could easily be cancelled. I’ll update this page with breaking developments. Subscribe for free Hap and Leonard cancellation or renewal alerts. 5/15/2018 Status Update: Hap and Leonard has been cancelled by SundanceTV. Details here. Find more Hap and Leonard TV series news or other SundanceTV TV show news. What do you think? Should SundanceTV have cancelled or renewed the Hap and Leonard TV show? Is it ending at the right time, or are you upset there will be no for season four? Like all good programs it’s doomed. I hope some other network picks it up. . . If the “talent” is willing. Seems just like Longmeyer. Are you kidding me? This is one of the best, funniest, most entertaining series EVER and it’s cancelled? This is a complete travesty. I am going to cry myself to sleep tonight and I curse those who decided against renewing this series. What a bunch of ********. I agree with you and the majority of others that can’t believe this excellent and vital show has been cancelled. Who makes these decisions anyway. Admit that I just learned about this show when browsing Netflix and immediately got pulled in ( read Binge watching). Sundance please reconsider Hap and Leonard is a show that we need and want to watch – listen to us please. It’s because of H & L that I am even aware that Sundance has a channel. This is TV worth watching! Please, please do not cancel-need to see more- hap and Leonard must continue- very moving and real and makes me laugh and cry. These two are absolutely perfect together, there bond and love knows no bounds. We want more 3 seasons is not enough. Agree with the comments asking Sundance to reconsider! We love Hap and Leonard!! I love Hap and Leonard, it’s one of my favorite shows. I hope Sundance reconsiders the cancelation of this show. At least give it one more season to finish the show. I hate that Hap & Leonard got cancelled!! I saw 1 promo for it this year & w/more promo the ratings would have improved! The acting is superb! Louis Gosset Jr & Dice Clay in the same show? That’s genius man. They deserve a 4 th season, it was just getting good! The director & showrunners, please take this to Netflix!! Love this show! So disappointed that it has been cancelled…hoping Sundance reconsiders or another network picks it up! The writing is superb! The Acting is fantastic!! Do NOT cancel Hap and Leonard!!!!! !